Clayton Skidmore is having a Plant Sale, and you’re invited. 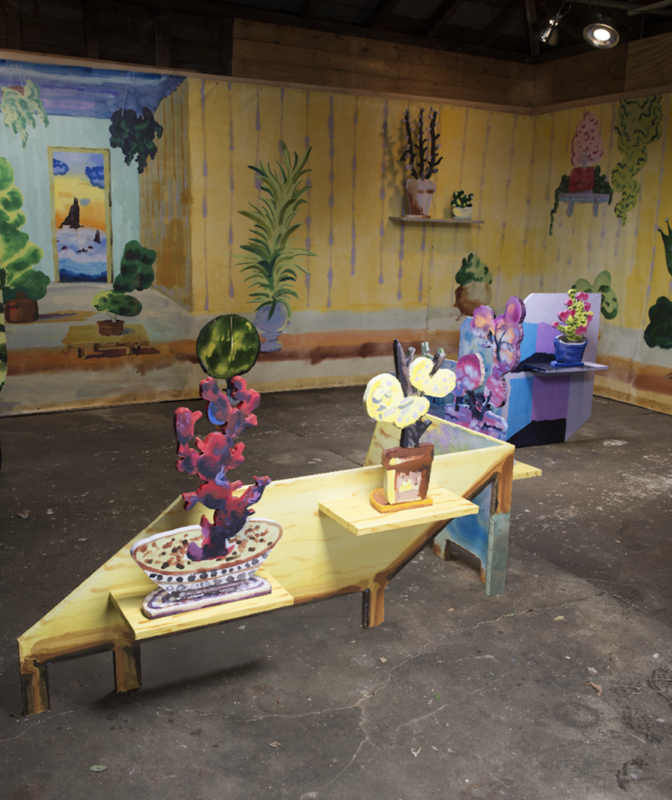 For three weeks, he’s transforming Life Lessons Garage into a plant shop, filled with his paintings of brightly colored, cartoonish, and apocalyptic plants. Like a supersized pop-up book brought to life, the space will be overtaken with cut-out plywood paintings, surrounded by large-scale canvas murals attached to the walls. 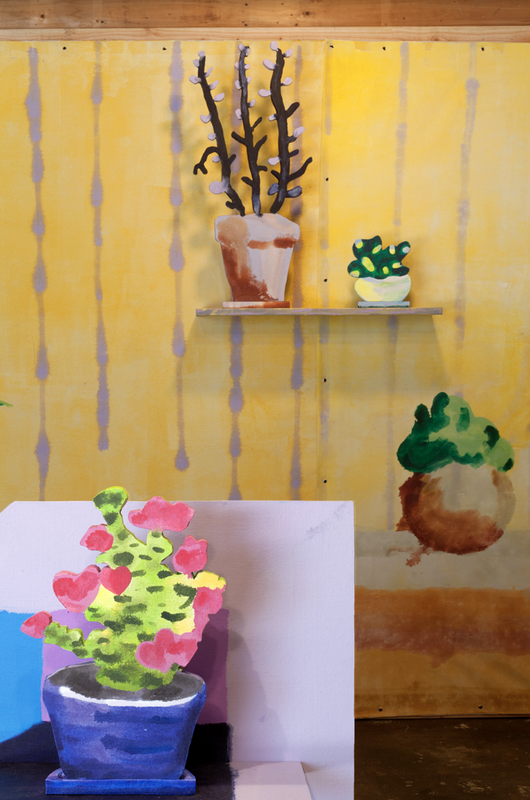 Skidmore explores the relationship between houseplants and paintings, both often brought into domestic spaces to act as windows into other worlds outside. 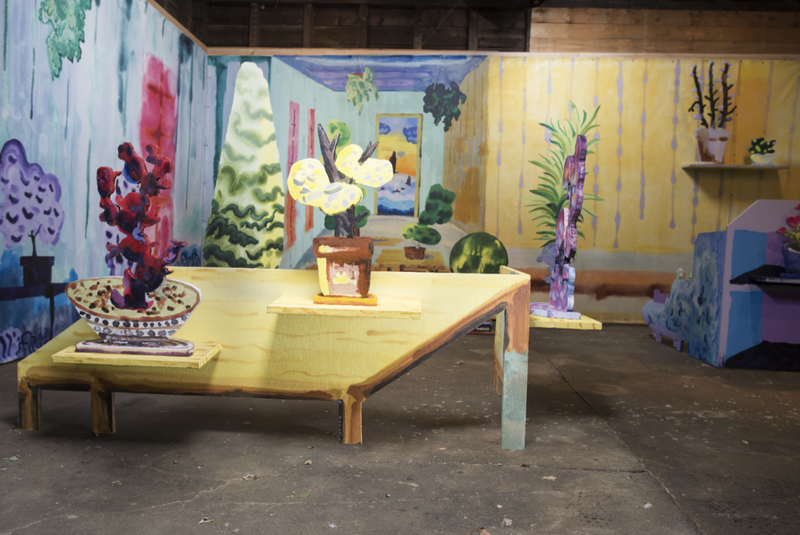 He’s interested in paintings and plants as props—objects positioned to provide support for things they’re not actually a part of. Like theater flats, both in construction and function, his three-dimensional paintings highlight the tenuous relationship between fantasy and reality. They exploit the fragility of the seams between belief and truth. 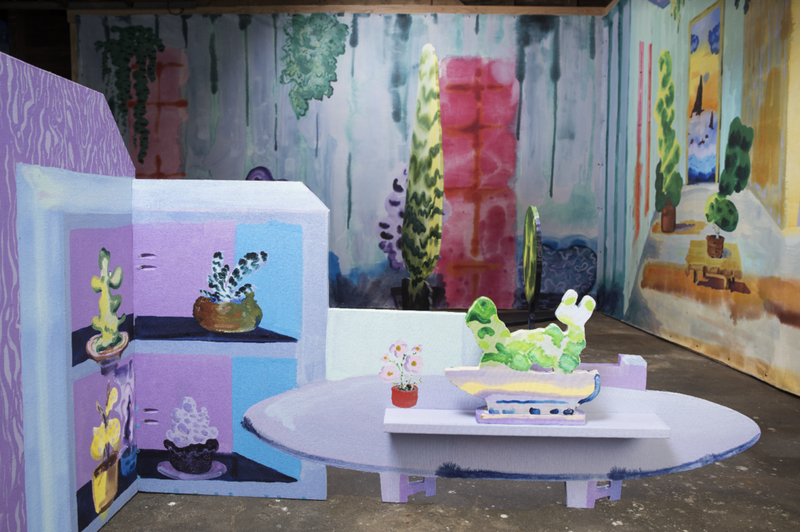 Through bleeding washes of color that simultaneously establish form while melting it away, Skidmore takes you to the seams between worlds—between dimensions and perspectives, the post-apocalyptic and the hopeful, between that “much needed” hip new plant shop in a gentrifying neighborhood, and a giant diorama of an erie garden, chopped up and rearranged. His shop blends the idealism of Little Golden Books with the horror of Black Mirror, creating a disorienting 21st century retail experience. Please join us for the grand opening of Plant Sale, and come prepared to sever your own piece of the installation to take home and plant in your world. Clayton Skidmore was born in Dallas, TX (1986) and lives and works in Queens, NY. He received a BFA in Painting from the Kansas City Art Institute (2009) and an MFA from Cornell University (2017). Skidmore’s work has been shown at Lovaas Projects, Munich; Tjaden Gallery, Ithaca; Caelum Gallery, New York; Homeland Security, Dallas; and Dolphin Gallery in Kansas City, MO.